More individuals learning to read and write. More individuals gaining greater self-confidence. More individuals learning to count and practice arithmetic. More individuals improving their motor skills and social skills. More program development for continued progress and achievement. The long-term outcomes of your monthly gift are courage, empowerment, and achievement. Ready to make a difference through monthly giving? Please click the button below: we thank you for your generosity! If you’d like to learn more about monthly giving impacts, please read on. GiGi's Playhouse is a one-of-a-kind achievement center for individuals with Ds, their families, and the community. Offering more than 25 therapeutic and educational programs free of charge, all programs are based on best practices for Ds learning styles, and customized to ensure individual success. Please don't let our program costs be a boundary to success! Through the generosity of monthly gifts, your support can make life-altering impacts on the lives of children and adults. Your support and their courage is the perfect combination! All monthly donors will receive quarterly updates on the impact of their generosity, including updates on programs, students and/or families they choose to support. Monthly gifts can also be made as an honorarium or memorial. 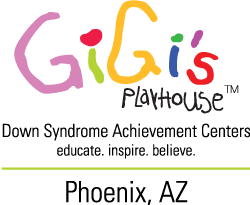 Extended families, neighbors and co-workers can form a GIVING CIRCLE, and provide monthly support of a GiGi’s Playhouse program as a team. Please help our children, adults and families enrich their lives and achieve their greatness! Thank you so much for your ongoing support!